Feminist Apps from the Obama Administration? In the tweet, I also mention the two apps from Obama’s previous apps against abuse challenge: Circle of 6 and On Watch. I haven’t had a chance to check them out much (although some of my students reviewed them for an assignment last semester). Are these feminist apps? Why/why not? This past summer, I became fascinated with smartphone Apps. I’m really interested in thinking about their potential for cultivating ethical (and virtuous) practices, particularly in relation to troublemaking and care. I plan to write a lot about apps in 2012: which ones I use, how I use them, how to trouble them, how to read them with/against self-help products. The first app I hope to write about soon is Bloom (first reaction: ugh and self-help is too tied to business and financial success). For now, I thought I’d post some details from Pew Research and an App study from their Internet and American Life Project. 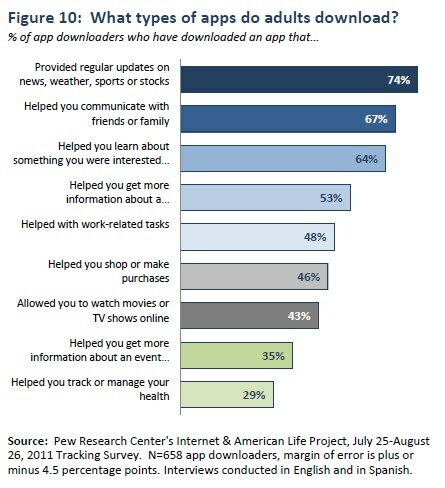 These charts come from Part 4: What types of Apps are adults downloading? For Figure 11, I wonder: why is race only Black and White? Pew Research has had some other studies (like this one) that discuss smartphone use among Latinos. After doing some digging, I discovered that Latinos (Hispanics) are mentioned in the full report. So, why are they left off of the abbreviated one? And why aren’t other races/ethnicities considered, like Asian American? Is it because they weren’t statistically significant (I must admit, I really don’t know much about statistics…)? 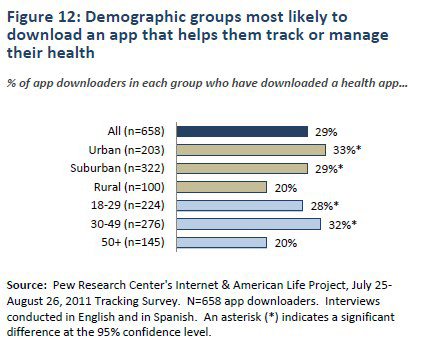 Finally, I wanted to add this figure on managing health, because I’m becoming increasingly interested in how people are using apps to care (physically, emotionally, intellectually, spiritually) for themselves. Yes! I definitely agree with Davidson. Many of my assignments, including my informal writing assignments for my feminist debates class this semester, are based on challenging and rethinking the typical writing a term paper approach by having students write a lot online. I think I need to write a blog entry about this assignment and about writing-as-process assignments for my classes. I’ll have to bring in Davidson and Now You See It. 2. fbomb is a really sweet feminist blog created and maintained by teenage feminists. It’s a great resource for anyone who wants one example of how young feminists are organizing/reflecting/acting/critically thinking/connecting online. Plus, their blogroll is really helpful for finding new blogs to check out. 3. Sir Ken Robinson on Creativity and Changing Educational Paradigms This link is to a brain pickings summary (and if you scroll down to the bottom of the post, there are some great links to other posts you might like, like this one: 7 Must-Read Books on Education, which lead me to this book–which I’m thinking of checking out: DIY U: Edupunks, Eduprenuers, and the Coming Transformation which I found on amazon and that has some pretty interesting looking “customers who bought this book also bought” selections. Uh oh. 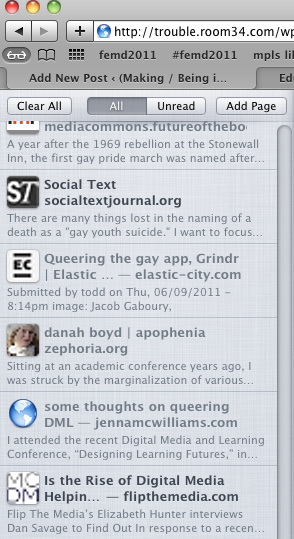 I’m going down the rabbit hole here…better stop). Here’s the Robinson’s video, which I may or may not have posted here before? The Queer Culture & Social Media Study is a documentary-style project exploring a queer generations relationship to social media and how that has influenced their sense of community and identity. I haven’t watched all of the videos here, but it seems important to archive it for future reference; the explicit focus on negotiating identity and community in relation to social media is intriguing. I am bothered by the heteronormativity (assumed heterosexual as natural) and the idea that women should/will be inspired to regularly care for themselves just so they can ogle hot guys. I want to think more about this campaign, because they also have a free App to encourage you to check your breasts. Hmm…an app that is about women and care. My immediate reaction to this app/campaign is “OH BOTHER!” However, I’m willing to think about it some more. I just downloaded the free app and have set it up the reminder on Thursdays at 4 (so in less than 30 minutes). Will I remember that I set this up? Doubtful. Next week, I will get my “man reminder” at some inopportune time and an awkward moment will ensue. 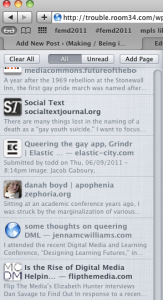 An interlude: This cleaning out sources is a lot of fun…and a lot of time. It’s a great exercise for getting inspired, being curious and thinking critically. I think it would be cool to do something like this on a weekly basis. 7. How Blogging Helps Students Crush the Digital Divide My ability to be curious is failing me right now, so this will have to be the last source I archive right now. Posted on July 21, 2011 on GOOD, it is about an elementary teacher who used blog writing to train a class who had previously had limited access to tech training and writing in English (over 60% were ESL students). A key claim in the article: giving students blog assignments encourages them to be creative and better writers + it provides them with digital literacy skills. While I really appreciate the focus here (and the claim), I wonder: Does this really crush the digital divide? confession: I’m a little behind on tracking my virtue. Doing this every day can be difficult. I’m on day four of tracking my practices of troublemaking. I gave myself another 3 for how I did because, as I mentioned in my last post, I don’t like using the ranking system; it just doesn’t seem like the best way in which to reflect/evaluate how or what I’m doing and why I’m doing it. As I write this entry, I’m starting to think more about how to assess my practices. One key aspect of Aristotelean ethics (yes, there are lots of different visions/versions of virtue ethics) is the idea of the mean and balancing virtue between the vices of excess and deficiency. I have a chart of Aristotle’s table of virtues and vices from Nicomachean Ethics that my college advisor, the amazing religion professor Garrett Paul, handed out in an ethics class that I took my freshman year, way back in 1992. I’m looking at it right now. In a framework of virtue (mean) and vices (excess/deficiency), you aim for a balance in which you are neither practice too much or too little of a certain virtue. While I see some problems with using balance as a goal for a virtue like troublemaking, I also find it helpful to be able to evaluate when troublemaking practices are excessive (there are limits to disruption, especially in relation to my feminist vision of social transformation) and when they are deficient. My daughter RJP reminds me (all the time) of the limits of excessive troublemaking. Here’s what I wrote a few weeks ago about it in my post, Really Rosie! and Really, Rosie? Being beside Rosie is always very helpful for my own thinking about troublemaking. Much like me, her troublemaking usually comes in the form of an insatiable curiosity and a refusal to merely accept what she is told. Because she asks so many questions and always demands explanations for why she must do this or believe that, she reminds me that engaging in troublemaking (or being around someone who is making trouble) can be exciting, exhilarating and exhausting. Indeed, troublemaking has its limits and shouldn’t be uncritically embraced as that which we should do all of the time. And when it is practiced, we need to remember how it can drain us or those around us. Throughout the past two and a half weeks, Rosie has prompted me to exclaim with joy, “Really Rosie!,” one minute, and then utter in annoyed disbelief, “Really, Rosie?,” the next. What if an app had a ranking system in which you aimed for the mean instead of a high number? That allowed you to focus on finding the balance between extremes? Can I (mis)use this app to do this? Speaking of (mis)using the app, the first thing that I wrote in my reflection box for day four is: Just realized that I might be hacking this app!? Am I using that term correctly? I’m thinking partly of the collection, Hacking the Academy, and their invoking of hacking–but what do they mean? Need to find a good definition. By hacking, I mean that I am troubling this app (critically questioning it and using it in ways that were never intended in order to practice troublemaking and to achieve my goal of tracking my trouble). I wonder, (how) are other people hacking their apps? I can think of some ways, mostly involving advanced technical skills (jailbreaks). What other ways are people using apps subversively? I’m on my third day of tracking my virtuous troublemaking. While I still don’t think their focus on daily rating your virtuous behavior is the most effective approach, I have enjoyed how using this app enables me to think about what I want in a virtue app and also what the practice of virtue on a regular basis might look like. I did my reflection/evaluation for day three this morning (on day four) because I didn’t have time or energy last night. In the summer–maybe because of the heat?–my brain shuts down around 4 PM. Oh well. I ranked myself at a 3 out of 3, partly because I’m over the ranking system and partly because I did spend a lot of time during the day thinking critically and creatively about the world and my work. I even mapped out an outline for my troublemaking book (next step: find a publisher!). Here are my thoughts from the reflection box: Another somewhat arbitrary ranking here. 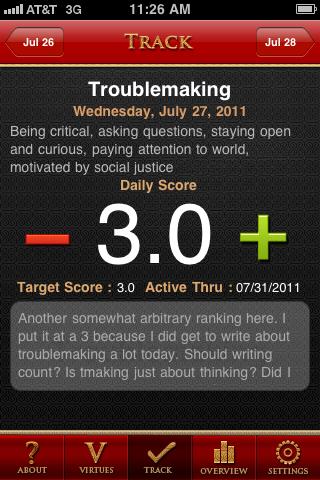 I put it at a 3 because I did get to write about troublemaking a lot today. Should writing count? Is tmaking just about thinking? Did I challenge anyone else today? Connections with an in relation to others? Still stuck on evaluation here. My reflection here is helpful for me in thinking through how often we should practice tmaking. One key concern I keep coming up against with this app is its lack of guidance in helping the user figure out what virtuous practice is and whether of not they are engaging in it. What resources does the user have to draw on when developing their own plan for tracking and reflecting on virtue? I suppose the most obvious answer to this question is Ben Franklin. But, what about other sources? The brief quotations that they provide from Franklin don’t offer enough substance for really thinking through virtuous practice. I find this to be a big problem with self-help/self-improvement products (books, apps, etc) in general; they provide quick answers without any larger vision to back them up. Rimke, H. M. (2000). Governing citizens through self-help literature. Cultural Studies, Volume 14, pp. 61-78.